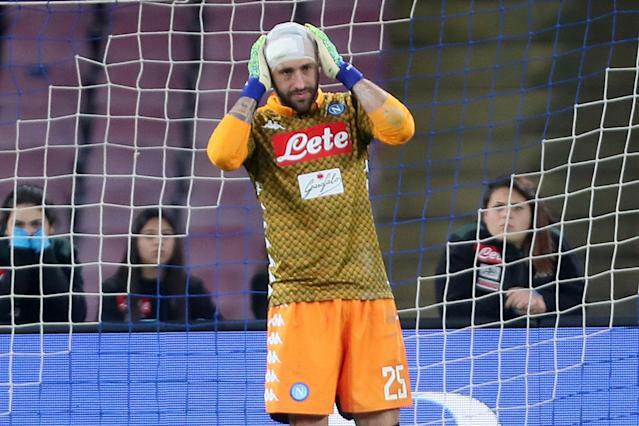 Five minutes into Napoli’s Serie A clash with Udinese on Sunday, David Ospina raced from his line to collect a cross, but collided with oncoming attacker Ignacio Pussetto. The Argentine winger struck the Colombian goalkeeper’s head with such force that Pussetto rolled on the floor, clutching his knee. 1. Take a serious headshot in the 5th minute of the game. Ospina received medical attention and had his cranium heavily wrapped. At that point, the medical team clearly deemed the 30-year Arsenal loanee fit to play on. But just over 30 minutes layer, having conceded two goals, Ospina collapsed on the field. While Ospina may have had a clear scan, why he was allowed to play for more than a third of a game with a concussion is not clear at all. This incident is the latest damning indictment of a sport that places treating brain injuries as secondary to victory. 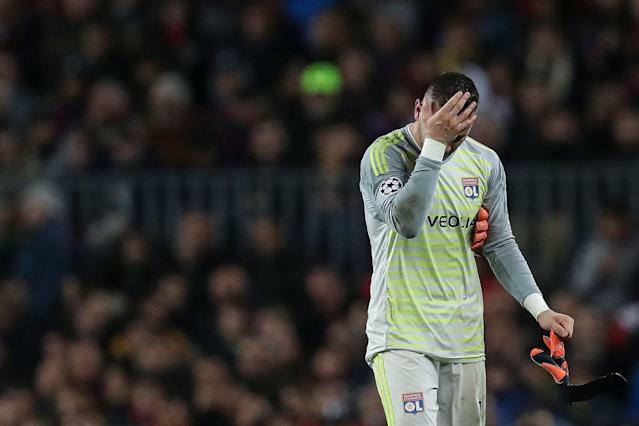 In last week’s Champions League game between Lyon and Barcelona, goalkeeper Anthony Lopes remained on the pitch 11 minutes after a clash with Philippe Coutinho. The week before that, Jamie Vardy collided with Ben Foster in the first half of Leicester’s Premier League game at Watford, but the striker stayed on the field until he had to be helped off in the 83rd minute. He clearly felt the effects of the knock to the head, but had risked an even more severe injury by playing on. "This is just a game, but we're talking about the health of players." Concussions haven’t even been taken seriously in the most visible instances. Liverpool goalkeeper Loris Karius had an error-strewn Champions League final last spring, but was later found to have suffered a concussion during a collision with Sergio Ramos. And most famously, Germany’s Christoph Kramer was visibly dazed after an early blow to the head in the 2014 World Cup Final. Despite asking the referee, “Is this the final?,” he was allowed to play on. He now admits he cannot remember the game. Understandably, these recent injuries have caused concern among organizations focused on player welfare. FIFPro has highlighted the failure to implement protocols, while brain injury charity Headway says it is “shocked and appalled” by the situation. The organizations who can actually make a difference in the policy, FIFA and UEFA, do not seem to be expressing quite as much concern. In protocols first introduced in 2014, Europe’s governing body UEFA said the referee can stop the game for up to three minutes “to allow the injured player to be assessed by the team doctor.” A player will only be allowed to continue “on specific confirmation by the team doctor to the referee of the player's fitness.” FIFA also mandates the three-minute rule and emphasizes that team physicians, and not managers, have the final say on whether a player can continue. It is quite clear that these protocols are either insufficient or not being obeyed. Essentially, there is a conflict of interest when a doctor employed by the team has the final say on a concussion call. In an environment where Jose Mourinho can have the physio fired for performing her duties, it is easy to believe that sporting concerns take priority. For the doctor’s opinion to be motivated only by player safety, they must be independent. The English Football Association’s guidelines, meanwhile, instruct teams to look for “dazed looks,” “confusion” and other telltale signs that sound less like Led Zeppelin songs. While some of these symptoms may be subjective, others have definitely been overlooked. When Manchester United’s Anthony Martial, for example, suffered a clash of heads at Watford in 2016, he quite clearly looked groggy in the minutes that followed. He was substituted clutching his head, only after a loss of possession that led to a goal. In the interest of balance, it’s worth noting that the Premier League opened a concussion study and in 2014 and sanctioned the use of a “tunnel doctor,” who would have access to slow-motion replays to aid the decision-making process. And the league has also successfully implemented a six-day ban from playing and training when a concussion is diagnosed. John Stones is a recent example of a player who had to miss a game as a precaution. However, it is not clear whether the tunnel doctor is independent, if they are always present, or whether they had any impact when Vardy and Martial played on in the aforementioned examples. And it is certainly true that soccer’s approach to concussions is paltry in comparison to other sports. At every NFL game, there are 30 medical professionals, including five people employed by the league in the booth specifically to asses injuries. “Concussion protocol” is now a phrase that is well known by NFL fans but may elicit a confused frown from European soccer followers. So, what can be done to improve player safety in relation to head injuries? For starters, the governing bodies can do much more to make concussions part of the conversation. For decades, the NFL did everything it could to suppress the link between its sport and brain injuries, but a sea change in public opinion and overwhelming medical evidence forced the league to change tact. FIFA and UEFA should take note. The governing bodies could also make it much easier for teams to follow protocol by changing the rules to their benefit. FIFPro advocates for the use of concussion substitutes, whereby a potentially concussed player can be replaced for as long as it takes to be assessed. If they are cleared to return to the game, the concussion sub can leave the field. The system is successfully employed in rugby. And crucially, FIFA must insist that the doctor with the final say on a player’s condition is independent. As it stands, we’re in the concussion version of Groundhog Day. A major incident happens; we react with despair; nothing is done. For this pattern to change, action needs to come from the top.